Description: Widely to supply power for vehicles, GPS, Mobile, Camera, MP3. Suitable for any DC 12V/24V Motorcycle, Boat, Riding Mower, Tractor, Car, etc. Wiring Kit for cigarette lighters to install in any 12V-24V Easy to be installed Material:ABS Heat Resisting Plastic Voltage:12-24 V Output Voltage: 5 V Color: Black USB Parameters: 5 V 2.1 A or 5V 1 A Size:4.3*3.7*3.7cm / 1.7*1.5*1.5inch Package Included: 1 x USB Cigarette Lighter Socket Note: 1.No retail package to save the cost and protect environment. 2.Do not connect the Socket to a power over 24V. Working Temperature:Min. -20 Celsius Degree, Max. 80 Celsius Degree. Load Power:0.18W. Easy to fit and remove, with dustproof and waterproof rubber cover. Waterproof Grade:IP65. 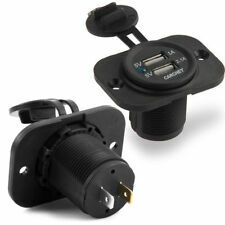 Features: Multi-function car charger splitter. 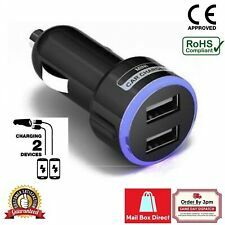 Designed with two sockets and two USB Ports Adjustable angle up to 180-degree maximum Applicable to all 12V car power, plug and play. Suitable for iPod, cell phone, MP3 player, PDA, etc. 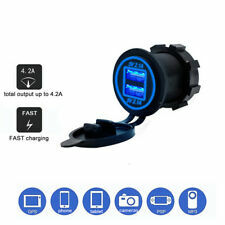 Charge and run multiple devices safely and rapidly while driving. Specification: Input voltage: DC12V USB output voltage/current: 1000mA Max current: 5A Total output power: 60W(except USB) Working temperature: 0-60 Degree Relative humidity: 5~70 per cent Housing Material: ABS plastic Size: (13.5 x 10 x 3.5)cm Colour: Black Included:. 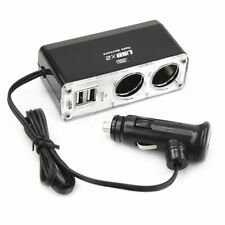 · Ultra-Compact Twin Port In Car Charging Adapter. USB Port 1: 1. USB Port 2: 1. Colour: Black. LED Colour: Blue. · Top Quality, CE Approved.